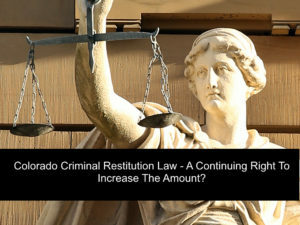 Colorado Criminal Restitution Law – A Continuing Right To Increase The Amount? – One of the most confusing aspects of any Colorado criminal case is the order to pay restitution. This article addresses the procedure underlying how the order for the amount of restitution is determined under the law and, most importanly how that order is made final. In a Colorado criminal case if restitution is owed it must be ordered. 4. The Final Order regarding restitution by the Trial Court may make a specific finding that the victim of the crime did not suffer a monetary loss and, therefore, no restitution is owed by the Defendant. Can A Colorado Order For Restitution In Criminal Cases Exceed The 91 Day Deadline? Under Colorado law the specific amount of restitution owed by a Colorado criminal Defendant does not have to be known or entered at the time of conviction and sentencing. The law allows a Court to extend the detailed Order for restitution for 91 days for to determine the amount of restitution which law also provides for a contested HEARING for the Defendant to challenge the amount of restitution sought by the District Attorney. While the Court must order restitution when it enters a judgment of conviction in a Colorado criminal case by entering an Order for Restitution, a Colorado criminal Defendant has the right to a hearing at which the prosecutor must prove by a preponderance of the evidence that the defendant is liable for the victim’s losses in the amount claimed. Can The Final Restitution Order Be Increased For Future Damages Incurred By The Victim As A Result of Continued Ongoing Expenses? Colorado law permits an ongoing obligation for restitution in the event that a victim has ongoing expenses such as medical costs. Here is the specific section of the law – that permits this ongoing obligation: Section C.R.S. § 18-1.3-603 (3). Restitution is clearly a mandatory part of a Defendant’s criminal sentence, BUT once a final sentence is imposed and the Defendant has begun serving it, an increase in the amount of restitution ordered violates the constitutional prohibition against double jeopardy. But while the law guarantees a Colorado criminal Defendant a “legitimate expectation of finality in the sentence,” the sentence may be increased without violating double jeopardy rules IF a final restitution obligation has not been set by the court and additional losses not known to the court or the prosecutor at the time the initial order was issued are later discovered. When Does A Colorado Restitution Order Become “Final” For The Purposes Of Double Jeopardy? Therefore, an original Order for restitution does not “foreclose the possibility of further restitution” where a Colorado Trial Court makes clear on the record that restitution is ongoing – for example where a victim’s medical expenses had not been resolved, a restitution order can be “kept open” by a Prosecutor’s office for the purposes of requesting a supplemental restitution award. But, under Section 18-1.3-603(3)(a), principles of Double Jeopardy DO apply in that a Colorado Prosecutor may not seek supplemental restitution if additional losses to a victim are known to him or her at the time the original restitution Order is entered. (4) (a) (I) Any order for restitution entered pursuant to this section is a final civil judgment in favor of the state and any victim. Notwithstanding any other civil or criminal statute or rule, any such judgment remains in force until the restitution is paid in full. The provisions of article 18.5 of title 16, C.R.S., apply notwithstanding the termination of a deferred judgment and sentence or a deferred adjudication, the entry of an order of expungement pursuant to section 19-1-306, C.R.S., or an order to seal entered pursuant to part 7 of article 72 of title 24, C.R.S. (II) Nothing in this paragraph (d) shall prohibit a non owner driver or passenger in the vehicle from being awarded restitution if the driver or passenger was not covered by his or her own medical payments coverage policy. H. Michael works hard to get his clients the best possible results in and out of the courtroom. He has written, and continues to write, extensively on Colorado criminal law and he hopes this article helps you in some small way – Colorado Criminal Restitution Law – A Continuing Right To Increase The Amount? 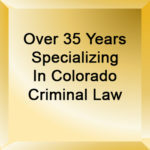 Colorado Criminal Restitution Law - A Continuing Right To Increase The Amount? One of the most confusing aspects of any Colorado criminal case is the order to pay restitution. This article addresses the procedure underlying how the order for the amount of restitution is determined under the law and, most importanly how that order is made final.